Whether you are a land lover or a man of the seas, everyone knows that you can't over load a ship. When a ship is out of balance someone will be thrown over board. The idea of balance and placement are skills important to winning the game Don't Rock the Boat. 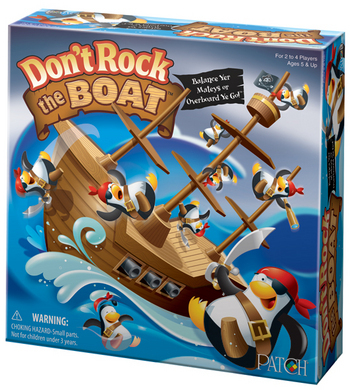 Don't Rock the Boat by Patch Games is fun for the whole family. 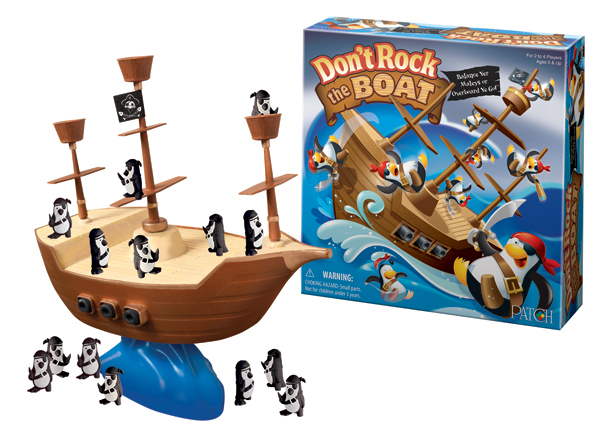 The premise of the game is to balance your pirate penguins carefully on the boat. But, be cautious on your placement or your pirate penguins will be dropped in into the sea. What I like about this game is that it can be played by a large range of ages. The concept of placing pirate penguins around the ship is easy to accomplish with large or small hands. More importantly, kids are learning the concept of balance and counterbalance by having fun. When playing with my kids, sometimes we play just to be silly. For example, we will see how many penguins we can stack in a silly way to make the penguins precariously perch on the boat before they tip. It can be fun to stack penguins only on the bow to see how far it will tip before they fall. Don't Rock the Boat is available online at patchproducts.com or can be purchased at various other retailers. It retails for approximately $16.99. Give the kids a gift that will entice their pirate adventure and tickle their funny bone with Don't Rock the Boat.